Ralph was able in illustrating and unfolding the doctrines of grace. Elder N. Richardson (to whom we are indebted for this biographical sketch), has baptized a number of persons who dated their convictions to the preaching of Ralph. When the anti-mission party was formed, we have been told that Ralph became an anti-missionary. When the legislature passed the law prohibiting colored men from preaching, Ralph was greatly mortified and had the sympathy of many brethren. Ralph was, no doubt, a truly pious and humble Christian, he had the confidence and esteem of thousands, and died in the full assurance of a blessed immortality. From Elder George W. Purefoy, The History of the Sandy Creek Baptist Association (1859). 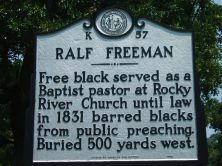 Ralph Freeman‘s headstone: RALPH. Died about 1838/ He was a Primitive Baptist/ Preacher of much force and /usefulness./ His freedom was/ purchased by the/ Bear Creek Association/ Erected 1907.